Welcome to my latest hub looking into the tools available in the Analysis ToolPak which is part of both Excel 2007 and Excel 2010. In this hub, I will be investigating the Rank and Percentile Tool. Ranking allows you to rank all your data in order from highest to lowest and Percentile allows you to easily categorise your data into percentiles such as the top 25%, top 50% etc. 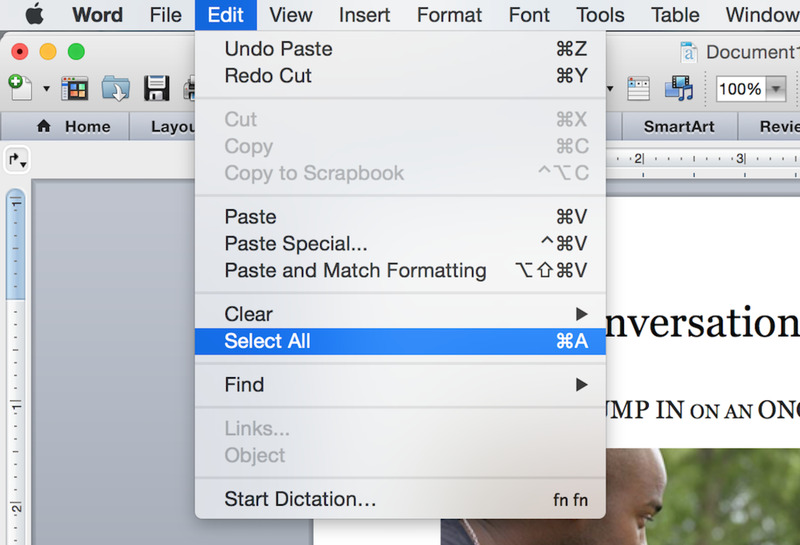 To illustrate how to use this tool, I will work through an example. In my example, I have a class of 30 students. I have just got their latest results and want to rank them and assign them grades based on their ranking within the class. The top 10% get an A, the next 20% get a B, the next 20% get a C and the remainder get a D grade. In conjunction with the Rank and Percentile tool, I will use the MATCH and INDEX functions to assign the student names to the raw data created by the tool. I will then use the IF function to automatically assign a grade to them based on their result as well. Now that we have added the Analysis ToolPak, select the Data Analysis button and select Rank and Percentile as shown below. You can see the output above from the tool. 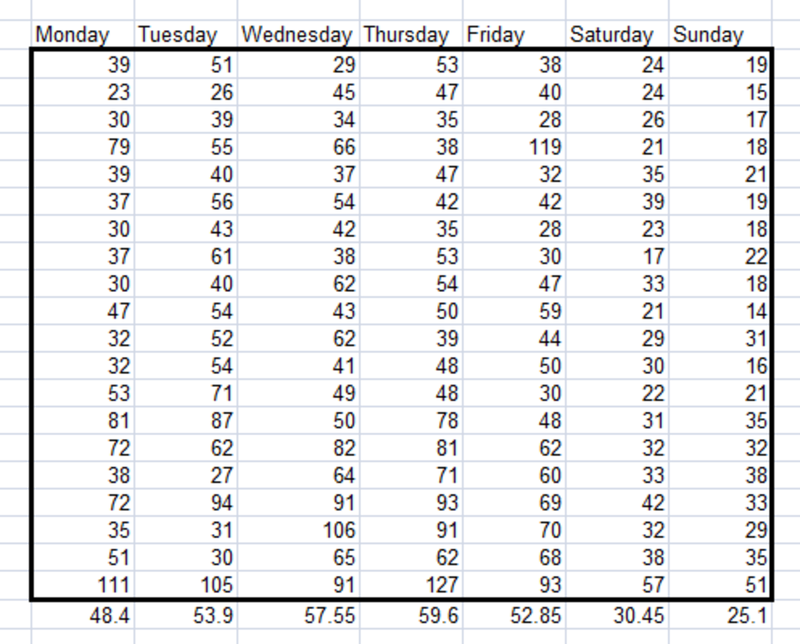 Excel has ranked every student and given them their exact percentile (the Percent column), however, rather than using the students names, there is a column called Point, which is the row number of each student. 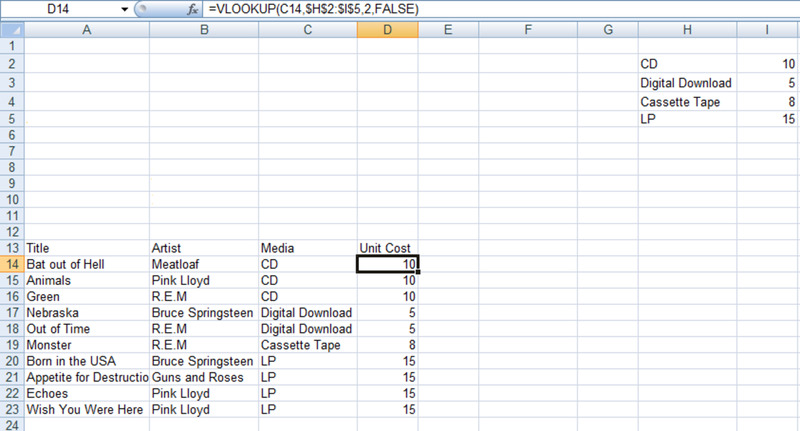 To turn the Point column into a column containing the student’s name, I need to turn to the MATCH and INDEX function. These two functions work in tandem to convert the results in the Point column to the student’s name. The MATCH function looks for the number in the Point column and then finds its exact match in the column labelled Student No. INDEX then looks for the cell adjacent to the result that MATCH found and returns the student’s name. Note: the $’s added to the cell references tells Excel 2007 and Excel 2010 that these cell references do not change even when the formula is copied to other cells (known as absolute cell references). 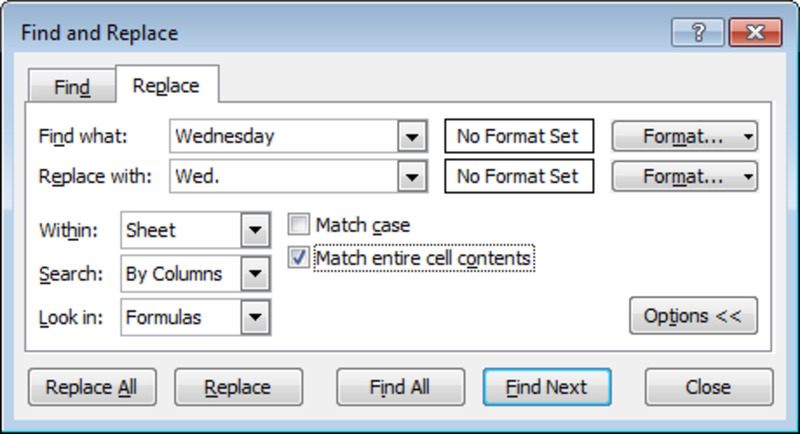 This prevents Excel from adding one to each cell reference each time you copy it (the formula would become =INDEX(B4:B33,MATCH(F4,A4:A33)) rather than =INDEX($B$3:$B$32,MATCH(F4,$A$3:$A$32)) which may otherwise provide a potentially incorrect result). I placed this formula in the column to the right of the Point column to make it easier to complete our final table with the column header of Student. This formula looks at the Percent column and looks at the percent and then assigns a letter based on the result it finds. Note: The order is vitally important, if we did it in the order C, B, A then we would end up with only D and C grades as Excel would look at all numbers above 50% and give them a C and the formula would end. Copy this formula to the remainder of the Grade column. The Rank and Percentile Tool from the Analysis ToolPak which is available in Excel 2007 and Excel 2010 allows us to work with data and rank it and then have Excel calculate its percentile. 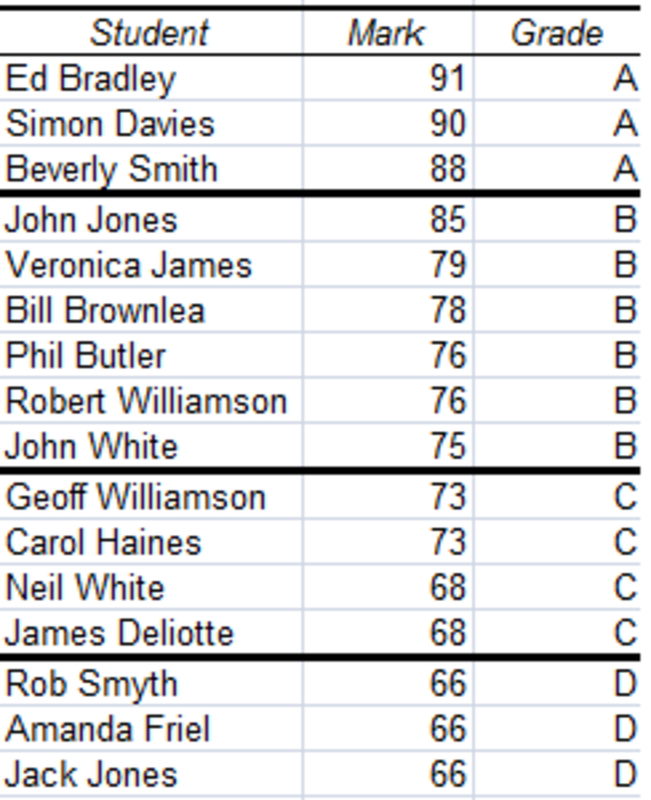 In my example today, I took my (fictional) class of students and ranked them according to their test results. I then gave them a grade depending on where they sat ranked against their peers. To accomplish this, I not only used the Rank and Percentile Tool, I also used the MATCH and INDEX functions to convert the results so that the name of the student appeared next to their grade, and then also used the IF command to automatically assign them their grade. 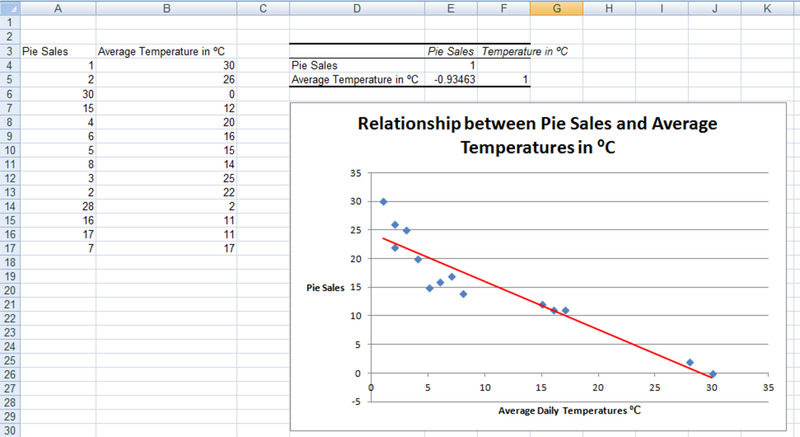 Example of a Regression, created using the Regression Tool from the Analysis Toolpak in Excel 2007 and Excel 2010. 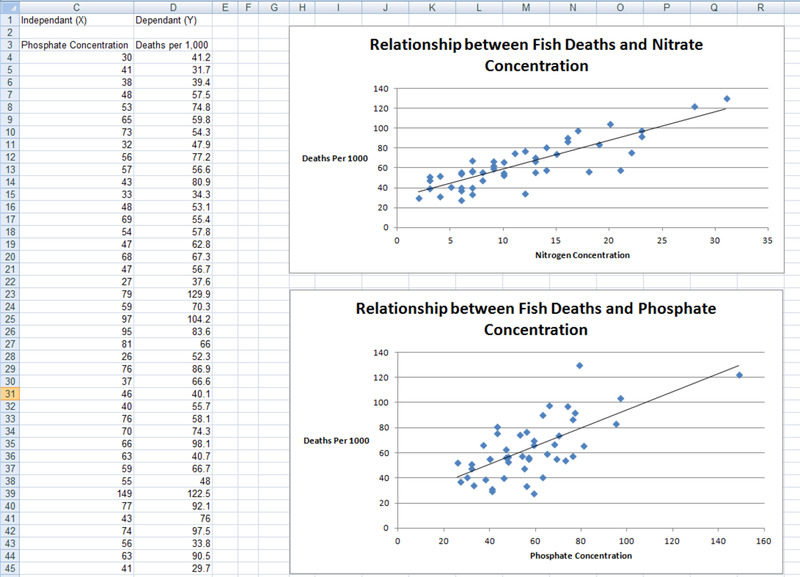 Example of a Correlation, created using the Correlation Tool from the Analysis Toolpak in Excel 2007 and Excel 2010. Histogram: this tool allows us to look at the distribution of your data in graphical form. 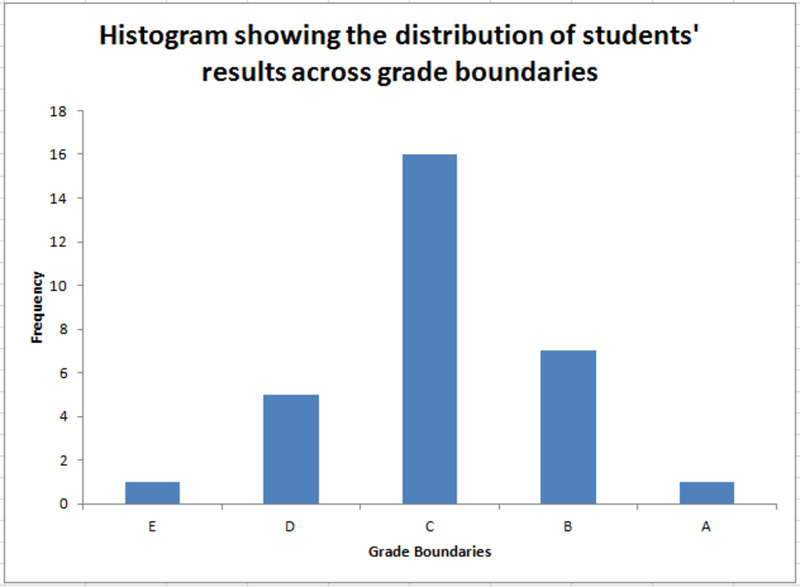 You can configure the boundary values the histogram uses to, for example, look at student exam data and chart the grade distribution across their results. Moving Average allows you to analyse your data for trends and chart your data and any trend line created by the tool should a trend be present. 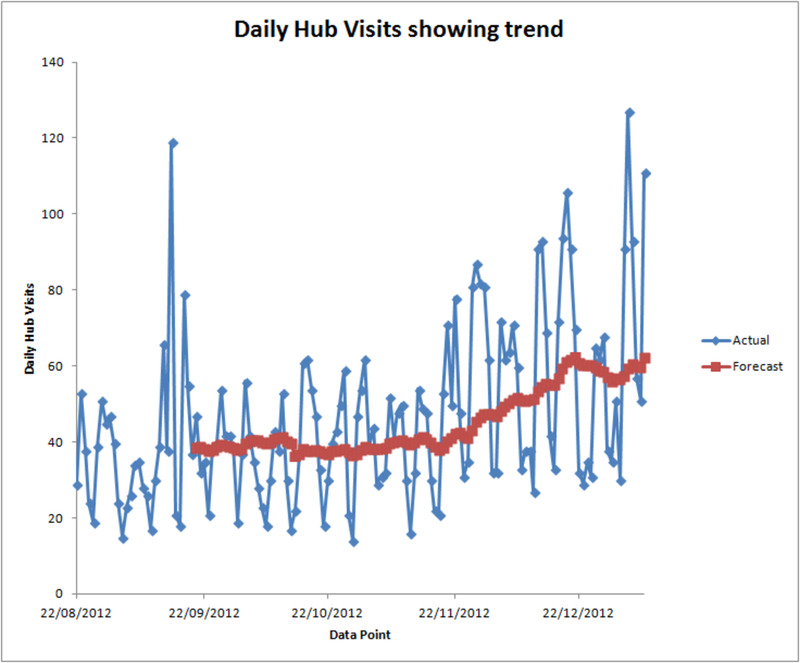 In my hub on this tool, I looked at my historic web traffic and whether there was a trend in that data. Sampling creates a random sample from a larger population you can analyse. I created lottery numbers from a pool in my example. Regression and Correlation allow you to look at the relationship between variables. Correlation allows you to test the relationship between variables and Regression allows you to visually display this using a linear regression. In the hub on correlation, I investigate the relationship between daily temperatures and pie sales and in the hub on regression, fish mortality and Phosphate and Nitrogen concentrations in water. 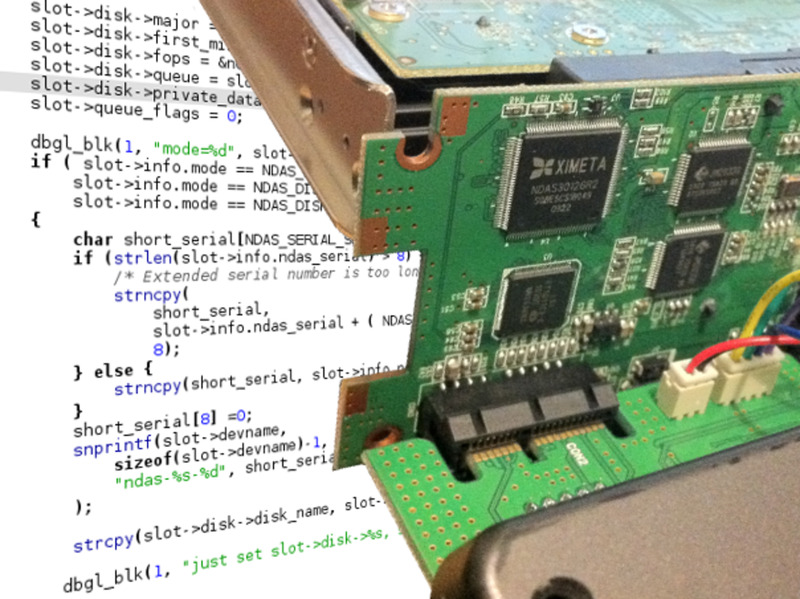 I do hope that you have found this hub both useful and informational. If you have any comments, please feel free to leave them below. 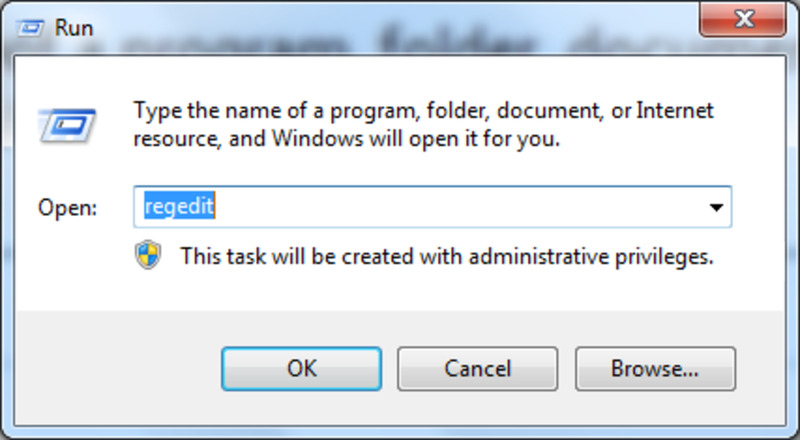 Which Tool from the Analysis ToolPak in Excel 2007 and Excel 2010 do you intend to (or already regularly) use?